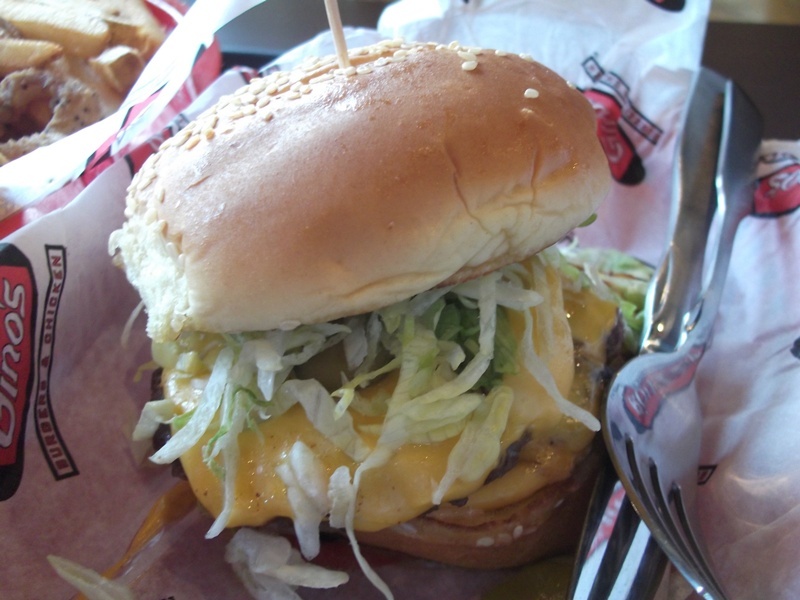 A great “wayback” burger… and a whole bunch of swag! 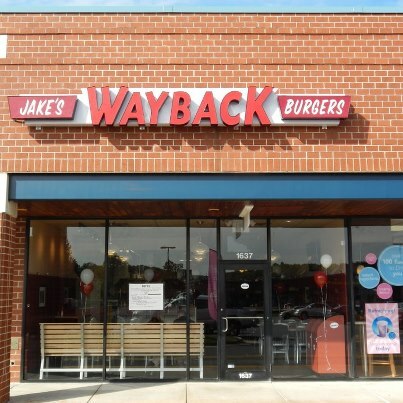 I visited the new Jake’s Wayback Burgers in Bel Air, MD for lunch with Mom and Dad. I have been to the Jake’s in Elkton, but the Bel Air location is new. Elkton is closer to where I go to school, but Bel Air is closer to where I live. It’s all Maryland – it’s all good! I ordered the Jake Burger which has 2 “hand pattied, never frozen” burger patties. 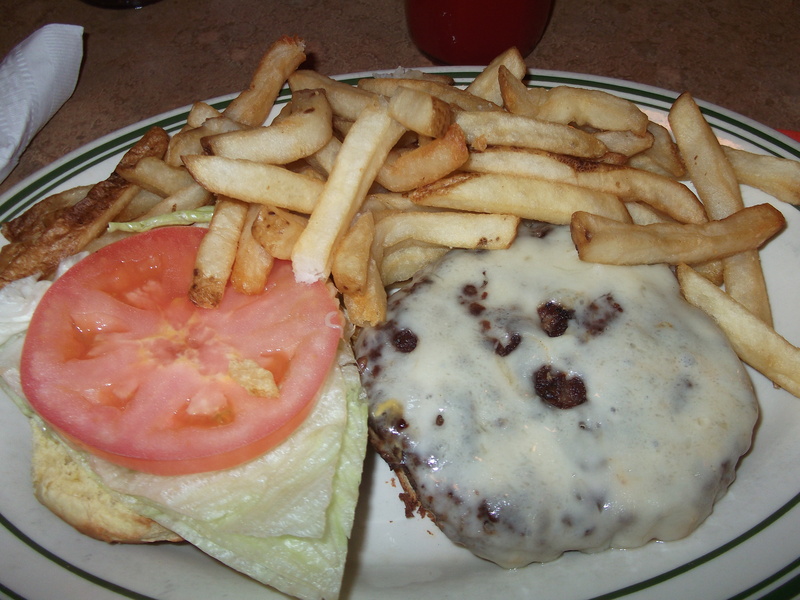 I customized my burger with American cheese (other options include bacon, chili, and extra cheese) and my old favorites lettuce & tomato (other options include onions, pickles, jalapenos, etc.). A side order of French fries and a strawberry milkshake completed my order. Dad had his burger (yeah… Mom let him have a burger… but it was a little kids Junior size burger!) with grilled onions and mustard. And he wonders why his breath smells? Ugh! One of the BEST parts of the visit was the amount of swag that they gave me in the store. They had free bumper stickers, pens, key fobs, and lanyards. I got the whole lot! I could decorate my bedroom with Jake’s Wayback swag! 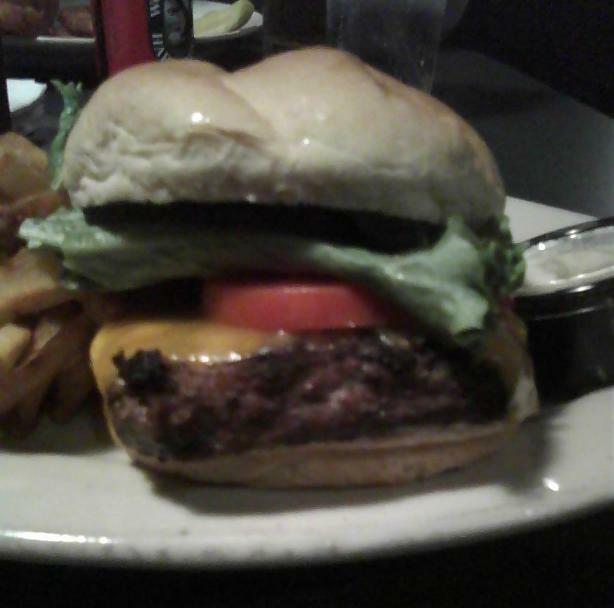 Jake’s makes a good burger. My burger was cooked to a nice medium-well without much pink. The fries were nice and crisp. 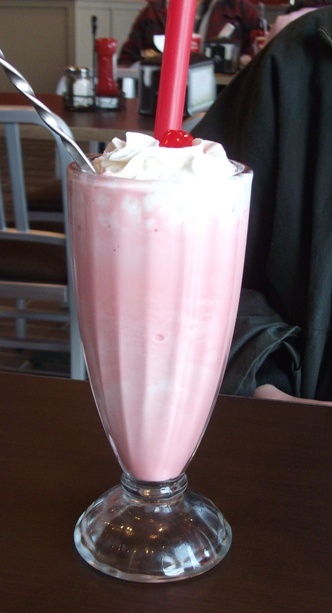 The strawberry milkshake was… er… milky… and… um… shaky, I guess. (Hey! This is a burger review! If you want a milkshake review then you start your own blog, buddy!) I award this an 8 out of 10. 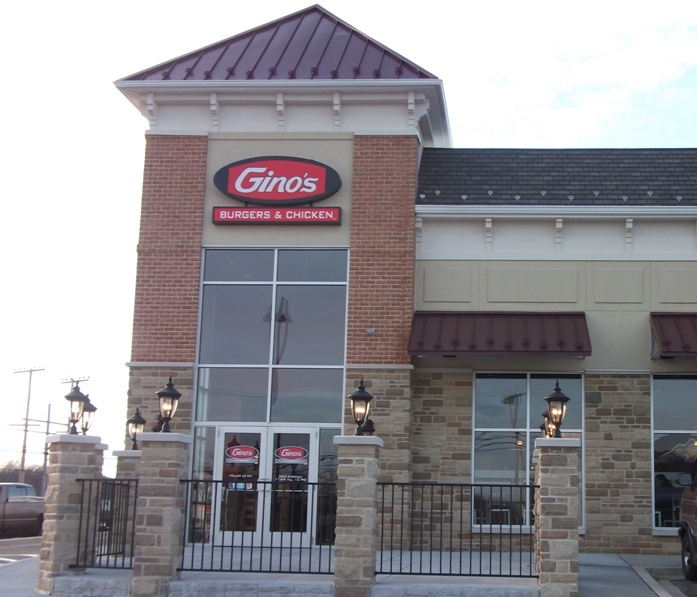 The restaurant is in a good location and if you live in Harford County you should definitely go and visit. I went to Bull on the Beach in Churchville, Maryland with Mom & Dad. It is nice and close to the baseball field where my team practices. It was the team’s last practice of the year. Our season goes on for longer than the MLB – we don’t finish until November! I ordered the Bull Burger with lettuce, tomato, cheddar cheese and a pot of BBQ sauce on the side. 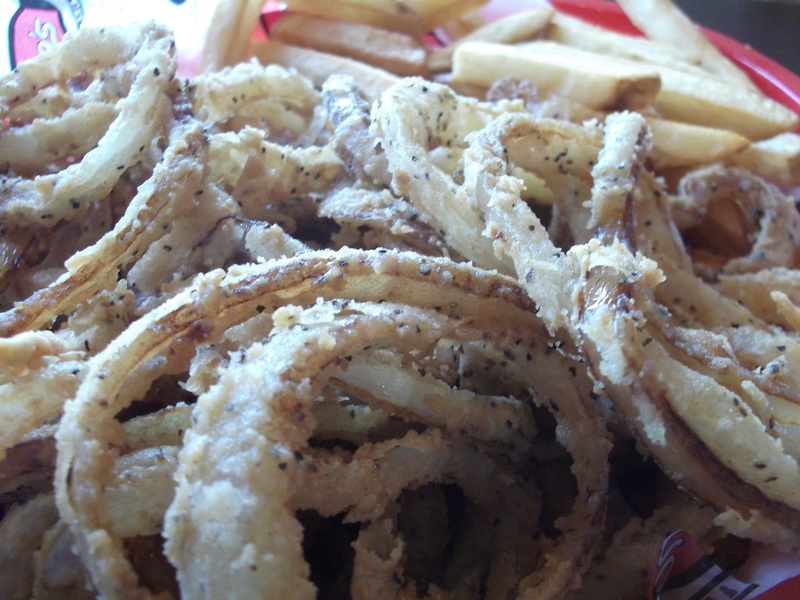 I had fries, but I was able to steal some of Mom’s onion rings! You can see in the photo that they also gave me a tub of mayonnaise on the side. Do I look French? Do I sound Canadian? This is Harford County, Maryland! I am surprised there is not a law in the county banning mayonnaise. I might write to the county council and ask them to do it. I award this burger a score of 6.5 out of 10. It was better than average because of the nice flame grilled taste. 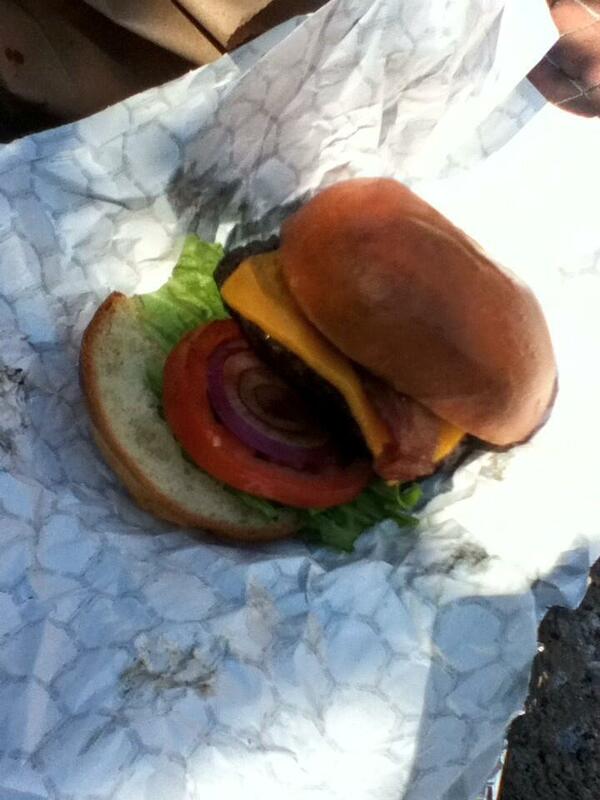 If they wanted these burgers to be even better then they would use fresh meat instead of frozen patties. That could easily make them score 7 or 8 out of 10. 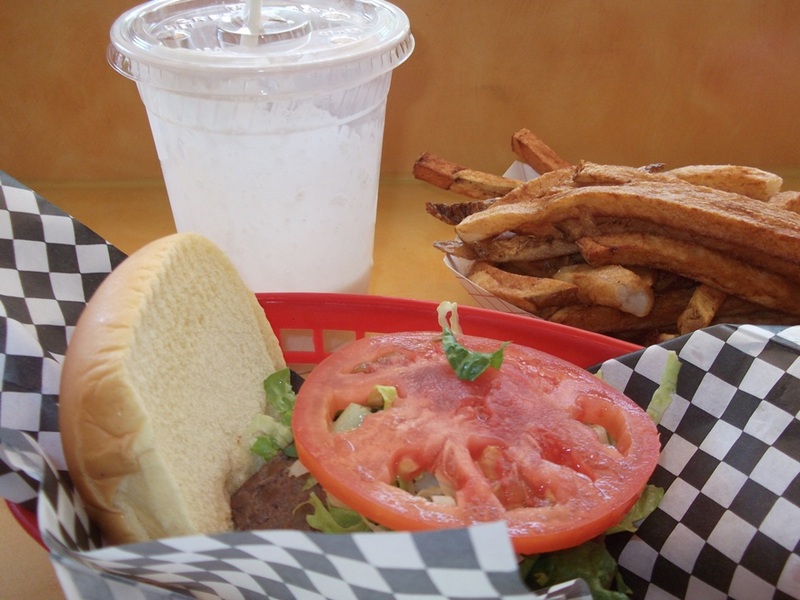 Bull on the Beach has its main locations in Ocean City, Maryland. I like Ocean City because it is Maryland’s beach town. When you visit “OCMD” you have to cross the bridges over to the Eastern Shore of the Chesapeake Bay which is miles & miles of flat farmland. Then you come to the coastal wetland and sand dunes and the big Atlantic Ocean beaches. My Dad says that during the winter there are only 5,000 people living in Ocean City, but during the summer it becomes the second largest city in Maryland with over 300,000 people. That’s a lot of people! w00t! w00t! Time for a Rootie Toot! I went to Mamie’s Cafe for dinner with Mom and Dad. It’s not far from where we live up here in the ‘burbs, but even if you guys live miles away I think it’s worth a visit. The decorations inside make it look like Borgin & Burkes. All the food on the menus is what Dad calls “home cooking” and the portions are HUGE (which is why I really think he likes going there). I ordered a “Rootie Toot” burger. Dad says that all of the burgers on the menu were named by Mamie’s grandson. That explains their names! The burgers are made from 100% fresh beef. There is no pink slime here! They are just great homemade burgers! I ordered mine with Swiss cheese and it melted SPECTACULARLY all over the burger patty. The lettuce was crisp and the tomato was thick and juicy. The fries were excellent. Warning: These burgers come served with mayonnaise. I saw that on the menu and asked for no mayonnaise. Make sure you do that. Unless you’re French. Or Canadian. Or just one of those crazy mayonnaise people. Mamie’s Cafe came to Aberdeen, MD in 2007 which is when I was… er… just 7-years old. Before that it was located in Baltimore (that’s what Mom and Dad say) in the Hampden neighborhood which is supposed to be one of the funky places to be. I wouldn’t know how funky Hampden is because my Dad gets lost driving in Baltimore and he can never find any place that he’s looking for. He could take me to the Baltimore Burger Bar or Cafe Hon but he refuses to ask Mom for directions. Ugh! Parents!